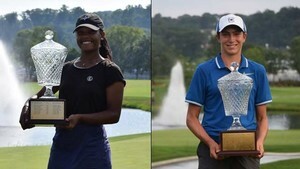 The 17th Northern Junior Championship presented by the Golf Performance Center concluded on Wednesday afternoon at the beautiful Great River Golf Club in Milford, Connecticut, but not without some complications courtesy of Mother Nature. For the first time in the history of the Northern Junior, the Boys Championship had to be shortened from a 36 hole competition to an 18 hole competition, with Benjamin James of Milford, Connecticut claiming the title after his stellar opening round of four under par 68. On the bright side, all competitors in the Girls Championship successfully completed 36 holes with Kyra Cox of South Salem, New York capturing the title with a two over par total of 146. This year also marks the first time both Tuesday and Wednesday’s rounds were affected by summer thunderstorms. Fortunately, Tuesday afternoon’s weather wasn’t as severe and players were able to enjoy a very special treat, courtesy of Great River Golf Club Head Superintendent Todd Tetreault and Jeff Swanson, Golf Course Manager for Sacred Heart University. Todd and Jeff, along with their amazing staff, constructed a nine hole mini golf course on the Great River putting green complete with bunkers, hazards, and many more challenges. Players were also treated to an ice cream sundae bar thanks to outstanding food and beverage staff. As for the competition, due to the arrangement of Wednesday’s tee times the Girls Competition was able to complete all 36 holes, and with a stellar final round of even par 72 Kyra Cox earned the title of Northern Junior Champion. Cox, who will attend Furman University this fall as part of their impressive Division I Women’s Golf Team, also recently captured the New York State Women’s Amateur. Cox’s two round total of 146 was enough to edge Bailey Davis of White Plains, Maryland and Malini Rudra of Syosset, New York by a single stroke. Rudra held the lead for much of the front nine on Wednesday after opening with a phenomenal three under par 33. A few dropped shots on the back nine by Rudra and a few too many close calls for birdies by Davis gave Cox just the opening she needed. A clutch birdie by Cox on the difficult 16th hole put her firmly in control, and with two solid pars on 17 and 18 she secured her victory. Maisie Filler of Bloomfield, Connecticut posted rounds of 77 and 71 to move up the leaderboard into solo fourth place, while Kaitlyn Lee finished two shots behind Filler in fifth place at six over par. In the Boys Championship, local superstar Benjamin James appeared to be cruising to victory on Wednesday afternoon when thunderstorms started approaching the Milford area. James stood at 8 under par for the tournament with five holes to play and held a commanding five shot lead on what is his home golf course. After a two hour weather delay and much deliberation, the Tournament Committee decided that in accordance with the USGA Rules of Golf, the competition must be reduced to an 18 hole event. Fortunately, it appears that this year’s outcome would have been the same given James’ outstanding play on both Tuesday and Wednesday. In the end, his opening round of four under par 68 was enough to claim the Northern Junior title by a single stroke over Christopher Fosdick of Middlefield, Connecticut. Fosdick finished in solo second place after his first round of three under 69, while Shane DeVincenzo of Port Jefferson, New York finished third at two under par. Rounding out the top five were Luca Ferrara of Toronto, Ontario at one under par, while Jude Cummings, Justin Mathew, Tyler Hahn, and Zachary Maloy all shared fifth place at even par 72. For the third year in a row, players of the Northern Junior enjoyed a special treat during the final round when they reached the 18th green. Sergeant Stewart of the United States Marine Corps greeted the players and attended the flagstick on the final green, appropriately adorned with a United States of America flag. Many players and families took the opportunity to offer their thanks and appreciation for his service and his dedication to the United States of America. It was yet another beautiful tribute to Stan Trojanowski, for whom the Northern Junior was originally founded. Stan Trojanowski was a marine himself, serving in World War II. Sadly, Stanley Trojanowski passed away in 2001 due to mesothelioma, yet his spirit and love for the game of golf continue to live on through golf’s next generation. This year marked the 17th playing of the Northern Junior Championship, an internationally recognized junior championship held each year in the state of Connecticut. The 2018 field featured players from 19 different states, provinces, and countries who had not reached their 19th birthday or entered college by August 8th. More information about this year’s event, as well as next year’s event, can be found at NorthernJunior.com. The Tournament Committee wishes to extend a sincere thank you to the golf staff, maintenance crew, and members of Great River Club for their support of this year’s event, especially Tom Rosati, Head Golf Professional. Additionally, thank you to the countless volunteers and Connecticut State Golf Association officials who helped to make this year’s Northern Junior a memorable experience for all of the players and families. Congratulations once again to Benjamin James and Kyra Cox, the 2018 Northern Junior champions. The Golf Performance Center is the Northeast's leading golf academy. Leveraging more than 20 years of experience, PGA and TPI Certified Founder Roger Knick and his coaching staff provide a unique methodology to training that focuses on the 5 Elements of Success: Desire, Coaching, Physical Performance & Nutrition, Mental Game, and Equipment. Combined with state-of-the-art training facilities and performance-assessment technologies, athletes enjoy customized programs designed to take their game to the next level and give them the competitive edge they seek. The Northern Junior Championship is a nationally ranked junior golf tournament that is contested over two days in Connecticut each summer, and is open to amateur boys and girls under the age of 19 who have not entered their first year of college. The tournament attracts a field of competitors from across the country and across the world, and is conducted with the goal of providing the same first-class championship experience offered at the best national amateur and professional events. Now in its 17th year, the Northern Junior Championship is conducted each year in memory of Stan Trojanowski, father of Cindy and Gary Trojanowski, who passed away in 2001 due to Mesothelioma.